Spring has arrived, characterized by warmer weather, more sun than clouds, longer days, and more activity. The itch to accomplish projects that have been put off since the fall hits, and you’re ready to dive right in and start getting home improvement projects done. But which ones exactly? Premier Polishing in Holbrook, NY, offers polished concrete, power washing, and sealing paver services. Below, we’ll review the best home improvement projects to do in the spring and tell you how we can help. Contact us today! Roof replacement or roof repair. The temperature in the spring is perfect for roofing. Shingle roofing uses a lot of adhesives that settle best in the spring temperatures. Plus, it’s the perfect opportunity to spot any damage the winter elements might have caused your roof, such as cracks or missing or loose panels. Be sure to check your attic as well to ensure no critters have decided to make a nest in your insulation. Exterior power washing. Winter can bring a lot of dirt and grime to the exterior of your home. 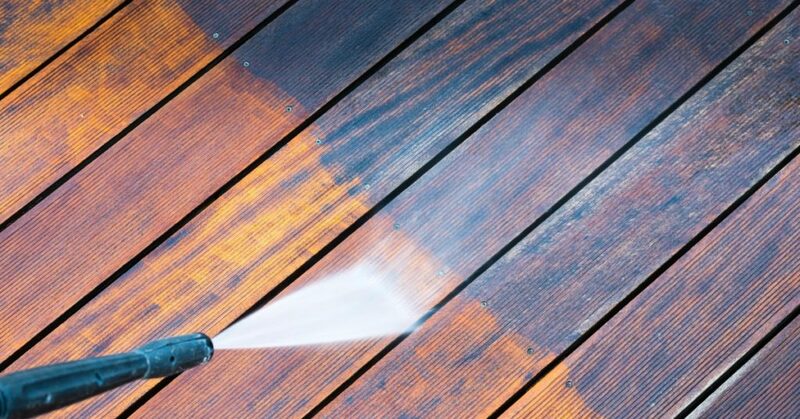 Power washing your home will remove all the dirt and debris, as well as give your home a shine for the summer. When you invest in a professional power washing service such as with Premier Polishing, you will limit damage to your home or office caused by dirt and pollutants as well as create a healthier environment as mold and mildew that is harmful for us is washed away. Professional power washing also saves you time, as well as limits the possibilities of damage since professional power washers understand how to use a power washer most effectively and safely. Cracks in concrete surfaces. Water is the number one element that causes damage to concrete because of its ability to expand and contract. In the early winter and early spring, when one day it’s hot and the next day it’s cold, your concrete surfaces are at their most vulnerable. Check your driveway, garage, patios, and walkways for cracks and have them either replaced or repaired as soon as possible so they don’t get bigger. Premier Polishing in Holbrook specializes in polished concrete flooring as well as sealing pavers. If you are in need of either service, give us a call today for an estimate on your concrete repair. Cracks in windows. Similar to cracks in concrete, freezing hail, snow, and strong winds can cause cracks in your windows. Look at your window sills and trim for signs of deterioration or damage as well. You’ll also want to clean your window panes both inside and out, which makes your home sparkle as well as lets in more light. Rechaulking windows is a great idea to maintain a sealed home so air conditioning can’t escape in the summer and heat can’t escape in the winter. This results in lower energy bills. Also, check all of your screens (or install them if you store them for the winter). Look for holes and gaps so bugs can’t get through. Exterior of your home. Whether you have a painted house or a house with siding, brick, wood, or other building material, you’ll want to check the exterior of your home for damage from the New York winter. If you have siding, look for warped siding (which can also be professionally power washed by Premier Polishing in Holbrook), and consider replacing your siding if it’s old and worn out. Check for flaking paint where you may need to touch up. Similarly, your home may need a fresh paint all around. Gutters. Gutters are often overlooked, but they are extremely important to the overall health of your home. The job of gutters is to direct water away from the home, so water does not sit erode your yard and soil, which can then lead to the foundation of your home settling. This affects the overall structural integrity of your home and could lead to major costs. Gutters also protect your flower beds and siding and helps to prevent your basement from flooding. During the winter, snow and ice can build up in gutters, putting extra weight on them and possibly pulling them away from the home. Check for signs of rust, cracks, mold, and other damage. Check the fixtures. Exterior home lighting is not only for aesthetics, but also for safety. Check the functionality of all your outdoor lighting fixtures, from the front porch to your patio and water feature. Be sure to check at night to make sure major walkways are properly, and consider adding more if not. If you’re going to be entertaining on cool summer evenings, consider landscape lighting to light up your beautiful annuals and perennials. Solar lighting is a great option for all night illumination that saves you money. Premier Polishing in Holbrook specializes in home improvement projects — particularly in polished concrete, power washing, and sealing pavers. The winters in New York can be harsh, and the springtime is a great time to assess any damage from the winter to your home. Premier Polishing is passionate in not only the appearance of your home, but also in protecting your home. Sealing stamped concrete and pavers offers the benefits of making your flooring in both your home and your outdoor areas beautiful and protected from environmental elements. We are a certified dealer in Husqvarna HIPERFLOOR®, which is a concrete surface polishing system that enhances the beauty and strength of concrete floors that is low maintenance and cost efficient. We offer free estimates on all of our services. If you’re in the Holbrook area, contact us today!